Welcome to the 2nd Memory Verse Monday! I hope you took the time to memorize the verse from last week on Fasting. If not then click here: Matthew 17:21. Today’s verse will be Joel 1:14. This is my prayer for every church in America and around the world. America is in the worst moral decline that this country has ever seen, crime is high and the economy is bad. Many of the people who have jobs are only working part time. 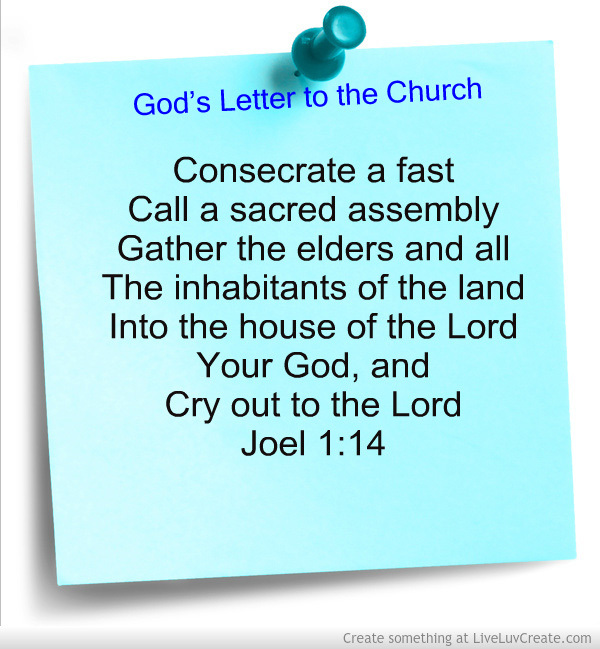 It is time that the churches in America cry out to the Lord in prayer and fasting. Please pray for America and it’s churches every time you try to memorize this verse. You might ask why I am memorizing this verse? We need to remind ourselves what the Lord has called us to do. Every time to work on this verse this week, you will be reminded of what to do to pray for revival and spiritual awakening. To understand this verse, you may wish to read all of Joel chapter one. Israel has been attacked by an enemy, their crops are in ruins. As you read this chapter think of all the events that have happened in America since 9-11. We have been attacked by enemies, drought, floods, wildfires, bombings, school shootings, hurricanes, tornadoes and many other disasters. Look what God told Israel to do when they saw such disasters. Ask yourselves this week if the church in America is doing what God has requested. Also ask yourself if you are doing what God has required of you.